Finding out what food cities are famous for and turning those foods into pizza has been a fun adventure so far this year. When I think of New York City I think of pizza. So for this week I decided to make my own New York style pizza. I have the same memory from each of my visits to the Big Apple: walking down the street while eating a thin crust traditional New York style slice. I can still feel the grease trickle from a folded slice down my wrist and to my elbow. To begin, I rolled my dough thinner than usual, then pre-baked it. Next, I spread on a layer of sauce and fresh mozzarella cheese. Last I covered the pizza with the toppings. 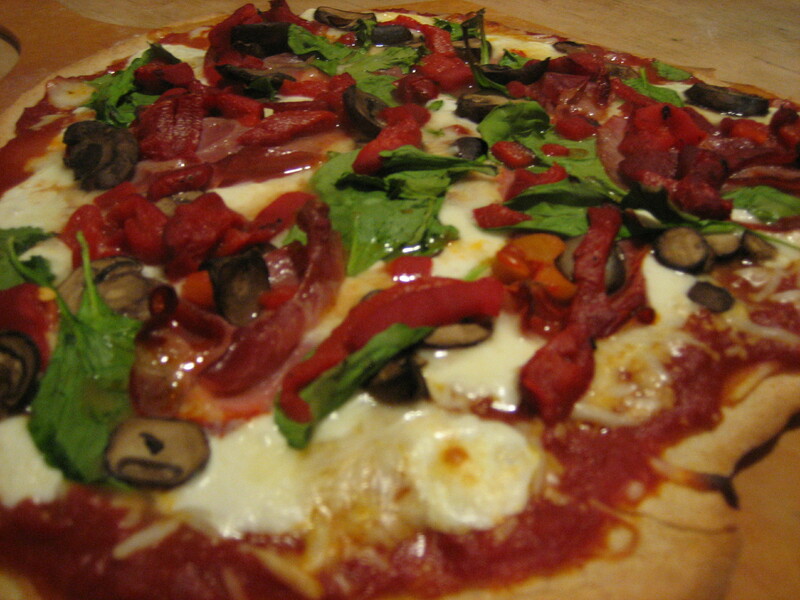 This week I used capicola, baby bella mushrooms, spinach and roasted red peppers because they taste great together and offer a healthy alternative to some of my most recent pizza creations. After the pizza was done baking I sliced it and we dug in. The veggies were fresh and tasted great with the capicola and mozzarella cheese. My New York style pizza recipe didn’t include the grease, but it was a delicious alternative to the Big Apple’s famous food. This entry was posted in capicola, cheese, marinara, meat, mozzarella, mushroom, peppers, sauce, spinach, veggie and tagged capicola, mozzarella cheese, mushrooms, New York style pizza, pizza, roasted red peppers, spinach. Bookmark the permalink. Yum! Griffin and I are about to concoct one of our favorites… an Indian-Greek-Italian Fusion. Naan Bread, pesto, roasted red peppers, fresh mozzerella, capicola, kalamata olives… and a hungry belly. Thanks for keeping us in your pizza cities loop! 6. enjoy paper dough pizza yum! That’s a fantastic idea Joey! Maybe you should start a blog about your kitchen adventures!